If you're in the trade why not take advantage of our bulk buy deals and save more. Remember Sealed Lead Acid batteries have a long shelf life making stock holding easy. Big savings on this DL123A 3 Volt 1400 mah Lithium Battery when you buy in bulk! This pack of 10 means you pay only $2.80 per battery! Save on the Ultralife U9VL-J 9 Volt Long Life Lithium Battery when you purchase this bulk buy contractor pack. This case of 10 means you pay only $6.50 per battery! Big savings on the L91 1.5 Volt Ultimate Lithium AA Battery (Two Pack) when you buy in bulk! Purchase this pack of 12 blister cards with two batteries each (total 24 batteries) and pay just $3.50 per pair! Big savings on the BatteryGuy BG-1250 F1 Terminal 12 volt 5 Ah Rechargeable Sealed Lead Acid battery with our bulk discount! Buy 20 or more for only $9.95 each! There is a premium alternative to this product for $13.95. 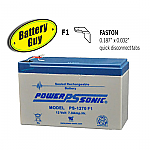 See the Power-Sonic PS-1250 F1 | SLA Battery 12v 5Ah. Big savings on the BatteryGuy BG-1250 F2 Terminal 12 volt 5 Ah Rechargeable Sealed Lead Acid battery with our bulk discount! Buy 20 or more for only $9.85 each! There is a premium alternative to this product for $13.95. 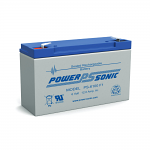 See the Power-Sonic PS-1250 F2 | Rechargeable SLA Battery 12v 5Ah. Big savings on the BatteryGuy BG-1270 F1 Terminal 12 volt 7 Ah Rechargeable Sealed Lead Acid battery! Buy 20 or more for only $11.25 each! There is a premium alternative to this product for $15.49. 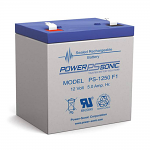 See the Power-Sonic PS-1270 F1 | Rechargeable SLA Battery 12v 7Ah. Big savings on the DL1/3N 3 Volt 160 mAh Duracell Lithium Battery when you buy in bulk! Purchase 18 batteries and pay just $3.55 per battery! Big savings on the L92 1.5 Volt Ultimate Lithium AAA Battery when you buy in bulk! Purchase 20 batteries and pay just $1.75 each! Batteries are packed loose in a box of twenty..
Big savings on the XL-050F 3.6 Volt 1200 Mah Lithium Battery when you buy in bulk. Our XL-050 battery is designed to work in Allen Bradley, Modicon, Siemens, etc. This case of 20 means you pay only $2.35 per battery! Big savings on the XL-050F/CASE1 3.6 Volt 1200 Mah Lithium Battery when you buy in bulk. This case of 20 means you pay only $3.00 per battery! XL-050F/CASE1 3.6 Volt 1200 Mah Utility Meter Lithium Battery. Our XL-050/CASE1 battery assembly is designed to work in ABB, GE, Schlumberger and Westinghouse time of use meters and electronic registers. Big savings on the XL-060F 3.6 Volt 2600 mAh PLC Lithium AA Battery when you buy in bulk! . This case of 20 means you pay only $2.75 per battery! Big savings on the XL-145F 3.6v 8500 mAh Lithium Battery when you buy in bulk. This case of 20 means you pay only $11.29 per battery! Big savings on the XL-205F 3.6v 19000 mAh Lithium Battery when you buy in bulk. This pack of 20 means you pay only $11.50 for each battery! Big savings on this DL123A 3 Volt 1400 mah Lithium Battery when you buy in bulk! This case of 30 (5 boxes containing 6 batteries each) means you pay only $2.30 per battery! Big savings on the BatteryGuy BG-6100 F1 Terminal 6 volt 12 Ah Rechargeable Sealed Lead Acid battery with our bulk discount! Buy 20 or more for only $11.50 each! There is a premium alternative to this product for $14.95. 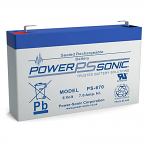 See the Power-Sonic PS-6100 F1 | Rechargeable SLA Battery 6v 12Ah. 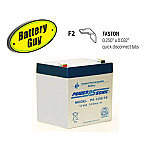 Big savings on the BatteryGuy BG-640 F1 Terminal battery with our bulk discount! Buy 20 or more batteries for only $4.50 each! There is a premium alternative to this product for $5.89. 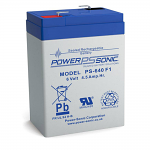 See the Power-Sonic PS-640 F1 | Rechargeable SLA Battery 6v 4.5Ah. Big savings on the BatteryGuy BG-670 6 volt 7 Ah Rechargeable Sealed Lead Acid battery with our bulk discount! Buy 20 or more for only $7.00 each! Big savings on the L91 1.5 Volt Ultimate Lithium AA Battery when you buy in bulk! Purchase 12 or more and pay just $1.75 per battery! Big savings on the L91 1.5 Volt Ultimate Lithium AA Battery (Two Pack) when you buy in bulk! Purchase 12 or more blister cards with two batteries each (total 24+ batteries) and pay just $3.50 per pair! Big savings on the L91 x 12 1.5 Volt Ultimate Lithium AA Battery when you buy in bulk! Purchase 12 batteries and pay just $1.75 each! Big savings on the L92 1.5 Volt Ultimate Lithium AA Battery when you buy in bulk! Purchase 20 or more and pay just $1.75 per pair! Big savings on this DL123A 3 Volt 1400 mah Lithium Battery when you buy in bulk! Buy 10 or more and pay only $2.80 per battery!